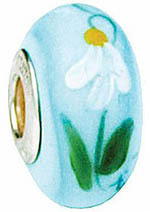 Artisan crafted glass beads designed and handcrafted in America by Fenton Art Glass. Fenton bead artisans crystalize the history and beauty of Fenton Art Glass in Williamstown, West Virginia. these handcrafted creations capture the legendary tradition of Fenton as wearable art! Celebrate the special times with balloons on Rosalene. Memories of summer as autumn draws near. Cool and refreshing sprigs of mint. Bright yellow centers embrace lovely white petals. Busy buzzing from petal to petal...little one. Oh, the web she weaves. Inspired by Jena L. Blair and TJ Mendenhall. turquoise, honey brown and bittersweet berries. Indulge in a luscious milk chocolate sprinkled with rich dark chocolate and strawberry sprinkles. A vivid array of colors, a "circus of dots." Delicate coral wildflowers off Cape Henlopen. Rich golden yellows tucked beneath a layer of crystal ice. Turquoise moons on a rich chocolate sky. Inspired by the many faces of the moon. Colorful hues of orchid beneath a layer of crystal ice. Inspired by the mysterious eye of the peacock feather. Awfully cute, but watch that stinger. Soft beautiful pulled feathers...a Ziegfeld favorite. Refreshing and beautiful frosted mint green with dazzling gold. This baby Blue Jay shivers on a frosty spring morning. Inspired by nature's ancient artwork. Inspired by a field of golden corn on a summer day. Deep cobalt and bright green glittering with gold. Second in the bird series. This charming design was inspired by a garden tableau. inspires this deep chocolate bead. Third in the Carnival Series circa 1907. Sweet daisy petals never fail...he loves me! The lighthouse stands as a beacon of guidance in the sea of life. Vibrant morning sunshine reflected in dew drops on petals. Delicate hearts with baby's breath. A touch of the wild side. Cool blue water filled with delicate lily pads. Tiny shamrocks with a bit o' leprechaun's gold. Deep red with black swirls capture the energy of a Paris dance hall. Inspired by Fenton designer Michelle Kibbe. This playful butterfly expresses eternal spring. Sweet memories of my grandma's kitchen. Cheerful Purple pansies turn their faces to the sun. Vibrant hues of golds, brown, coral and turquoise. A salute to the rich heritage and valor of South Carolina. Luminous colors rising from the midst of flames. A garland of bright flowers...a pure delight. Inspired by the beautiful state flower of West Virginia. An early sign of spring's eternal promise. Take time to stop and smell the Fenton roses. Sunshine on a beautiful southwest landscape. Frosty and refreshing on a warm summer day. Patriotism lives in American Hearts forever. Happy little daisy petals dance on the summer breeze. Dancing musical notes make lovely music. A rose is a rose, my dearest love. Deep purples and greens of a rare and beautiful orchid. Delicate berry vines nestled in pine. Deep purple hues of vines heavy with grapes. Return To Our Fenton Art Glass Home Page. ©Fenton Art Glass Co., 700 Elizabeth Street, Williamstown, West Virginia 26187.